Patti Teel - Solving children's sleep problems. Includes the original Floppy Sleep Game recording and 7 new tracks devoted to enjoyable relaxation exercises. Other books give scant attention to the most useful long term sleep solution: teaching children the skills that will enable them to consciously relax their bodies and minds in order to fall asleep. Week One: Parents read the relaxation routine to their child, assisting him or her with the relaxation process. Week Two: The parent remains in the child’s room but rather than reading the relaxation instructions, the child follows the directions on the recording. Week Three: The child falls asleep with the recording, without the parent in the room. Week Four: The child is relaxing and falling asleep independently, with or without the recording. 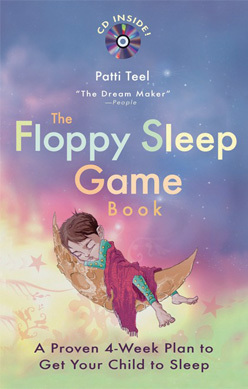 The Floppy Sleep Game Book and CD will give parents the tools to help their children establish good sleep patterns and finally get the rest they need.